In December 2016, tests of four slab track systems — LVT (RZDstroy, Russia), FFB (MaxBögl, Germany), NBT (Alstom, France), and EBS (Tines, Poland) — were completed at VNIIZhT’s test facilities in Scherbinka near Moscow. The tests were conducted in accordance with a field test programme and methods validated by Russian Railways (RZD). The four-track line section selected for the trials carried a gross tonnage of 600 million tons throughout the approximately 22 month-long test. Following reforms introduced on July 1 2014, most maintenance and repair (MROs) of Russian locomotives was transferred to independent service companies. 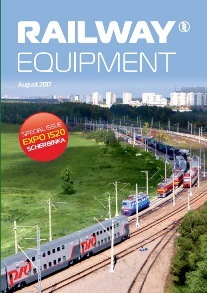 Almost 15,000 of Russian Railways’ (RZD) locomotives, or more than 70% of the TPS fleet, are now serviced and repaired under a 40-year contract with enterprises which are part of Locomotive Technologies (LokoTech), with the service companies’ revenue depending on the locomotives performance. The technical specification for Russia’s very high-speed rolling stock was developed in 2015 and further updated in 2017. The specification follows world best practice for operating very high-speed trains and also incorporates experiences from high-speed operations using Siemens Velaro RUS high-speed trains on the Moscow – St Petersburg line. In the entire course of history, 10 years is a very short space of time. But for an institution committed to achieving its objectives, and when all representatives are working together towards a specific objective, a great deal can and has been accomplished in this period. The Union of Industries of Railway Equipment (UIRE) was established on June 14th 2007. Its founder and president is Valentin Gapanovitch, and the association consists of 174 member-companies from 34 federal states of the Russian Federation. Together the member companies are responsible for almost 90% of Russia’s total railway industrial output.